Thank you for choosing to stay with us at Birch Hill, we hope you enjoy your stay. Please find below the terms and conditions applicable to our site. We abbreviate Certificated Location to ‘CL’. We use the word ‘outfit’ as a generic term to describe a motorhome or a caravan towed by a car. Our operating certificate is issued by the Caravan and Motorhome Club under Paragraph 5 of the First Schedule of The Caravan Sites and Control of Development Act, 1960. Only members of the Caravan and Motorhome Club on producing their membership cards may be accommodated on the CL, for the purposes of recreation. Not more than 5 caravans, motor caravans or trailer tents may be stationed on the CL at any time. No caravan or motor caravan shall be allowed to stay for more than 28 consecutive days. No tent camping to be allowed on site (only a small single-berth pup tent ancillary to the main outfit can be accepted). With effect from 1st November 2018, our pitch fee is £14 per outfit per night, including electric hook-up. We make no charge for the use of our Wi-Fi. If you need to cancel your booking please notify us as soon as possible so that we may re-offer the pitch. For one-night stays, the full fee of £14 is payable at time of booking, otherwise a deposit of £20 is payable at time of booking. Once we confirm your booking, your deposit payments are non-refundable and non-transferable. The balance of your pitch fee is payable on your arrival day by cash or cheque payable to ‘Mrs J E Kelly’. If you choose to leave early, your pitch fee is not refundable or transferable (in practice, our experience is the opposite – many people ask to extend their stay here longer than their original booking). Call at the house before siting and we will give you guidance regarding siting, in particular to show you the hard-standings during wetter months. If we are not at home, our mobile phone numbers are beside the back door – please try ringing us, we might not be far away. You are required to produce your Caravan and Motorhome Club membership card on arrival. If you cannot prove current membership of the Club, we reserve the right to ask you to leave, and your deposit will be forfeited. Please arrive after 12 noon and vacate your pitch before 12 noon on your day of departure. We will do our best, where possible, to accommodate earlier arrivals or later departures. Our main concern is to have no more than 5 outfits on site at any one time. We allow a maximum of 2 dogs per outfit. You are required to keep your animal(s) under close control at all times and clean up after them. Within reason, you are welcome to have day-time visitors during your stay. Please let us know that you are expecting them, so that we can account for everyone on site in an emergency, and to discuss where they are to park their vehicles. Our guests are responsible for the behaviour of any visitors (including animals) they invite. This is a quiet site and our main concerns are safety and that visitors do not disturb fellow guests. CLs are intended for recreational purposes and our expectation is that guests bring one car as the towing vehicle. Large motorhomes occasionally bring a car as a ‘runaround’ vehicle. If you wish to bring more than one car, please arrange this with us in advance. We will require the registration numbers of the additional cars so that we know “who’s who” on site. We do not allow charging of electric cars as it would not be economic, based on our low nightly pitch-fee. We have 16A hook-ups and charge a flat-rate pitch fee inclusive of ‘reasonable use’ of electricity. We do not permit charging of electric cars or using electricity to heat awnings as we believe this is not ‘reasonable use’. For economy and fire safety, please switch heaters off unless you are on site. 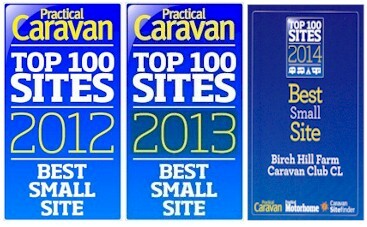 As a Certificated Location, Birch Hill only accepts 5 caravans at a time. Normally, visitors may stay for as little as one night, but our site is so popular at Bank Holidays, that we only take advance bookings from people planning to ‘stay for or pay for’ more than a just a few nights over a Bank Holiday period. The minimum length of stay varies between 3 and 7 nights, depending on the popularity of the Bank Holiday. In line with Caravan and Motorhome Club rules, we reserve the right to refuse acceptance or to terminate the visit of any person whose conduct, or that of their animals, is detrimental to us or to our other visitors. We will do our best to accommodate special needs or disabilities. Please explain your needs at time of booking in case we need to make special arrangements. We will not be held responsible for any loss or damage, however caused, to your property or vehicles or any injury to you or your visitors whilst staying on our CL. We sometimes take photographs of the CL for our Facebook page or website. Please let us know if you would prefer that we don’t include you. This web site and its components are offered for informational purposes only; we shall not be responsible or liable for the accuracy, usefulness or availability of any information transmitted or made available via this site, and shall not be responsible or liable for any error or omissions in that information. Please familiarise yourself with the Caravan and Motorhome Club’s guidance for staying on a CL on pages 280 & 281 of the 2017/2018 Sites Directory & Handbook.